Loss of crucial data from SSD drive is a great disaster that demands a reliable solution to rescue the missing files. 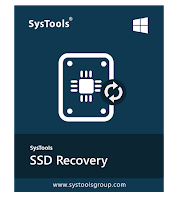 SysTools SSD Data Recovery Software is an automated tool, specially designed to recover permanently deleted, formatted, corrupted and lost data items from exFAT, FAT, and NTFS partitions of SSD drives in Windows OS. This Solid State Drive Data Recovery Software is reviewed by MVP and marked it as best. The improper functioning of controller chip, presence of bad sectors in SSD drives, and some other dangerous factors makes SSD drive data inaccessible. The Advanced SSD Recovery Tool is capable enough to recover data from a minor level or highly corrupted SSD disk drives. It scans all corrupted files/ folders and recovers them in a healthy state within a few simple clicks. With this SSD Recovery Tool, you can easily recuperate data files that have been lost due to intentional or accidental deletion. It performs deep scanning of drive and recovers entire shift deleted data items within a few minutes. In order to avoid inconvenience, it highlights permanently deleted data in red color after performing recovery. So, it is the best utility to recover permanently deleted data from SSD. If you are using solid state drive on your computer, laptop or pc. And thinking that your saved files, images, videos, documents and other files are safe. Then, you are wrong, the data loss can also be occur in SSD. In this, you need a reliable solution to recover lost files from solid state drive. The SysTools SSD file recovery software is the best utility for tech and non-tech users. SSD drives contain all types of file including data files, documents, audio/ video files, images, PDFs, etc. This tool is capable of recovering all data contained by an SSD disk drive. It can restore any file from SSD drive in their original format. Formatting in NTFS or FAT, usually removes all files and folders from a solid state drive. However, SSD Data Recovery software is capable of recovering files from a formatted or reformatted solid state drive. During scanning, it will detect the available partitions and show these to the users. There are two types of SSD drive available in the market: NVMe and m.2. This tool is designed to restore deleted files from both types of SSD disk drive (NVMe recovery and m.2 Recovery). No matter which type of SSD you own, this utility will come handy for you. Often, important files get accidentally shift-deleted from SSD disks. In that case, users should take help of SSD Data Recovery Software. It can retrieve shift deleted files and folders from both FAT and NTFS type SSD drive without a short time. Download the software and recover permanently deleted files from solid state drive easily. Damaged or corrupted SSD disks can become the cause of user inconvenience. Usually, files of a corrupted SSD disk become irretrievable, but not in the case of SSD Data Recovery Software. The application is capable of restoring files even from highly corrupted solid state drives. Besides recovering data from corrupted SSD disk, this SSD recovery software also allows users to extract and save the data. From the Preview, users can select the files they need to save. The tool will save only those files on any location of the local system. Two useful features of this software provide convenience to its users. Quick Scan recovers deleted files from SSD drive in a short time. Preview shows the retrieved files with attributes like file name, type, creation date, modification date, size, etc. For permanently deleted file recovery from ssd select Scan option and for formatted ssd recovery hit on Formatted Scan. Once the lost or deleted SSD drive files are found, users can find out any particular file out of these. The smart searching option offers filters such as “creation date” or “modification date”. Using these filters, users can easily locate any file of their choice. The software easily list recovered data into solid state drive file recovery software panel. You can recover all the corrupted, lost, and formatted data from your SSD in a couple of clicks using this professional SSD recovery software and save the recovered data without any manipulation. In order to avoid user inconvenience, the entire data recovered by the tool will be saved with its original folder hierarchy. No matter if your SSD is failed, corrupted or inaccessible, the SSD Recovery Tool is an efficient way to recover all the data from it. You can use this software to restore lost multimedia items from GPT as well as MBR partitions of your Solid State Drive. It allows to fix SSD unallocated partition issue. The software is designed in such a manner that it can auto-detect all the connected external solid state drives to a computer. Users can select any desired drive and check all its basic attributes such as Device ID, Device Media Type, Device Model, File System Type, Total Space, Free Space etc. Solid State Drive Recovery Tool can be operated in any Windows OS. You can download and run this tool on Windows 10, Windows 8, Windows 7, and all below versions of Microsoft Windows OS to retrieve data from any brands’ SSD regardless of its size.